In naturopathic medicine, it is common knowledge that vitamin U is the compound in cabbage juice that has tremendous healing properties. Much like Dr. Price’s X Factor (identified as vitamin K2), it has since been identified as S methylmethionine (SMM). Between 1948 – 1950, Dr. Garnett Cheney, professor of medicine at Stanford Medical School, performed several studies indicating that the most common source of SMM is found in the leaves of green cabbage. He further hypothesized that fresh raw cabbage juice may be able to significantly increase the rate of healing in patients suffering with gastrointestinal ulceration, acid reflux, stomach pain, skin ulcers, and ulcers in the digestive tract. It may also control diabetes, and strengthen the immune system. Dr. Cheny did quite a few studies (here, here and here are just a few of the studies he published) that indicated the efficacy of using fresh raw cabbage juice to treat ulcers of many kinds. As a result, Vitamin U (unidentified substance) became part of the naturopathic arsenal. Cabbage is an excellent source of Vitamin C. It also contains significant amounts of glutamine, an amino acid found in great abundance in the intestine, which has anti-inflammatory properties. It is a source of indole-3-carbinol, or I3C, which is converted to DIM in the intestine. Indole-3-carbinol is also a powerful antioxidant that supports liver detoxification. In European folk medicine, cabbage leaves are used to treat acute inflammation. A paste of raw cabbage may be place in a cabbage leaf and wrapped around the affected area to reduce discomfort. Some claim it is effective in relieving painfully engorged breasts in breastfeeding women. Taking the healing properties of raw cabbage juice one step further, the process of fermenting the cabbage juice adds to it’s tremendous healing powers by adding billions of beneficial bacteria, enzymes and vitamins and minerals produced by the microflora. In a study published in the British Journal of Nutrition in March 2011 researchers found that cabbage juices, particularly sauerkraut juice, may be responsible for their chemopreventive activity demonstrated by epidemiological studies and in animal models. Other epidemiological studies show that cruciferous vegetables protect humans against cancer. Results from animal experiments show that crucifers reduce chemically induced tumor formation. DIM is produced in the stomach when you eat cruciferous vegetables such as cabbage. A study published by the journal BMC Gastroenterology in May 2009, showed that DIM exerted anti-cancer effects in both in vivo and in vitro models. There are many studies that demonstrate the anti-cancer effects of DIM, produced from eating cruciferous vegetables. Treatment with DIM significantly attenuated loss of body weight, shortening of the colon, and severe clinical signs in a colitis model. This was associated with a remarkableamelioration of the disruption of the colonic architecture and a significant reduction in colonic myeloperoxidase activity and production of prostaglandin E(2), nitric oxide, and proinflammatory cytokines. Further, DIM administration dramatically decreased the number of colon tumors in AOM/DSS mice. Clearly, DIM is an important anti-cancer and anti-inflammatory substance. It also seems to work well with other important compounds produced in our intestines, such as butyrate. 3,3′-diindolylmethane (DIM) was able to down-regulate survivin and enhance the effects of butyrate in apoptosis induction and prevention of familial adenomatous polyposis in APC(min/+) mice. Thus, the combination of DIM and butyrate is potentially an effective strategy for the prevention of colon cancer. Butyrate is made by the body but it is also supplied by food we eat, particularly, butter. In a study published in the Journal of Food Protection in September 2006 investigators found that the juice from brassica oleracea leaf (a form of cabbage) was found to be effective in inhibiting the growth of Salmonella Enteritidis, verotoxigenic Escherichia coli O157:H7, E. coli HB producing thermolabile toxin, nontoxigenic E. coli, and Listeria monocytogenes. These are extremely toxic bacteria that cause food poisoning and even death. We have seen many cases of lethal bacteria in our conventional food supply that have caused severe sickness and death in some cases. Why do some people get very sick when exposed to these toxins and others do not? Perhaps it is due to the microbial mileau that a person hosts — the presence of certain bacteria and compounds are protective as shown by these studies. In a study published in the journal Food Chemistry Toxicology in October 2010, researchers found that a “biconverted product of cabbage” — in other words, fermented cabbage juice — displayed potential anti-candida effects against Candida albicans KACC 30062, Candida geochares KACC 30061, Candida albicans KACC 30003, Candida saitoana KACC 41238 and Candida glabrata P00368 (clinical isolate). The researchers concluded that fermented cabbage juice has potential therapeutic value of medicinal significance to control Candida species including clinical isolates. Several other studies (here, here and here) also suggest that Candida albicans may be controlled by fermented cabbage juice! This is HUGE for all those people suffering from the effects of Candida albicans overgrowth. In the first introductory stage of the GAPS diet, foods are limited to basic stocks, braised meats and some vegetables. However, probiotic foods are started immediately and the juice from homemade sauerkraut is the very first probiotic food offered. Why is this? It is because fermented cabbage juice is loaded with beneficial bacteria and nutrients that are pre-digested. These nutrients are so easy to digest, people with very serious intestinal disorders can tolerate it. Cruciferous vegetables (known as goitrogens) should never be eaten raw, because of the displacement of iodine and the potential effect on the thyroid. Cooking decreases the negative effects, but it is not clear how fermenting the juice affects it — some articles reference that fermenting soy actually increases the goitrogenic effects of that particular food. However, when eaten in small quantities for any of the medicinal reasons above, the benefits may outweigh any risk.Traditionally, many sauerkraut recipes include seaweed as a source of iodine which would balance the effects. 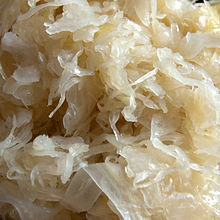 Additionally, fermented cabbage (or the juice) should be used as a condiment with meals, not as side dish sized portions. In some cultures, sauerkraut or kimchee is eaten every day with no apparent negative effects on the normal populations. If you suffer from any thyroid condition you would want to consult your health care provider before proceeding with regular use of fermented cabbage juice. As always, seek the advise of your personal physician before making any changes to your diet. See the rest of my disclaimer here. أولا: أشكر حضرتك على طريقة تخمير الكرنب. ثانيا: انا عملت زى ماحضرتك كاتب، لكن حطيط ملح ناعم اللى موجود فيه اليود، وبعديها قرأت فى اكثر من موقع ان لازم يتحط ملح خشن بس حاولت ابحث عن السبب لكن مالاقتش، فكنت عايز اعرف هل الملح الناعم بيقتل البكتريا النافعة والا عادى مش بيضر فى حاجة. دلوقتى يا حاج محمد انا فتحت البرطمان اللى فيه الكرنب وباكله مالقتش فيه ملح، لقيته حامض، وطعمه جميل جدا، وزى ماكنت قولت لحضرتك انى استخدمت الملح اللى فيه يود، وكنت عايز اعرف طالما الكرنب تم تخميره بالطريقة الصحيحة وتحول الملح بفعل البكتيريا الى طعم حامض شبيه بالخل كده، فهل كده الكرنب بقى غنى بالبروبيوتيك والا فيه نسبة قليلة. الله يهنيك ويديك الصحة، انا سيبت التخليل حوالى ١٥ يوم.